UPMC's Chief Innovation Officer says it's time to dig deeper into what matters, shares a pet peeve and recounts the first time U.S. CTO Aneesh Chopra sent him a tweet. Rasu Shrestha, MD, is the Chief Innovation Officer at the University of Pittsburgh Medical Center and a renowned change agent with a penchant for patient-centered care and operational transformation. And at HIMSS17 he will among the sanctioned Social Media Ambassadors. 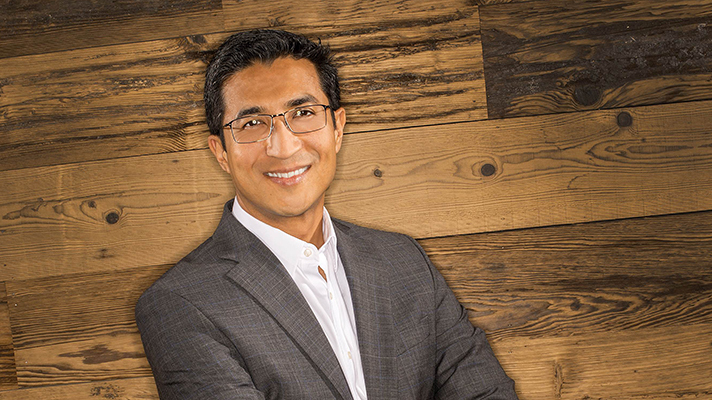 Healthcare IT News asked Shrestha – @RasuShrestha on Twitter – which issues are top of mind among his peers and followers, who his health IT hero is and what he’s most looking forward to at this year's conference. Q: What issues are top-of-mind for your social media followers? A: There is currently an air of uncertainty in our industry. Uncertainty makes many uncomfortable, but if we truly open our eyes and our minds, we will see many opportunities. Uncertain times call for us to dig deeper into what matters the most and lean closer to the authentic relationships we have built over the years — and new ones we should be looking to foster on the path ahead. I believe this is what many of my social media connections are doing. Having been through months of a turbulent political cycle roller-coaster ride, many are neither willing nor ready to quite ease into cycles of uninhibited productivity. There are many unanswered questions around healthcare policy directions. But the opportunity to leverage all of the progress made in the past few years, in broadening access to care, in the journey from analogue to digital, in embracing analytics, mobility and the cloud — these are all substrates that my peers are looking to build on. The future of healthcare will indeed be built on the shoulders of the strongest of partnerships. Q: Who's your favorite healthcare hero? Why? A: One of the things I enjoy the most about my interactions on Twitter is the ability to connect, at scale, with so many brilliant individuals, who in their own ways, are truly trying to make a difference in healthcare. I feel blessed to know so many everyday extraordinary heroes, and look forward to engaging with many more yet. These heroes — patient advocates, clinicians, innovators, data scientists, design thinkers, policy wonks and entrepreneurs — all have one thing in common: they do not take no for an answer. My first contact with Aneesh Chopra was via a tweet that he sent to me. After climbing back on my chair and dusting myself off, I attempted to digest the fact that I was actually interacting with the first chief technology officer of the United States. Aneesh is a tremendous healthcare hero not just because he’s wickedly intelligent and brilliantly well spoken, but also because he’s a dreamer and a bridge builder. He likes to get stuff done, and that’s a trait all my heroes share too. Aneesh’s superpower is to be able to, in one single sweep, connect the micro to the macro, and convince you of how a little action with one interface or one patient could make an impact across a population or the nation as a whole. Q: What's your pet peeve? (Either on- or off-line?) What is something your social media followers do not know about you? A: When style is not backed up by substance, my interest immediately starts to fizzle. There’s only so far you can go while riding on the hype train. I prefer to be awed by action rather than blinded by buzzwords. Authentic connections lead to meaningful paths forward — and that’s the path that’s most appealing to me. Q: What are you most looking forward to at HIMSS17? A: The HIMSS conference is like an annual pilgrimage for those of us involved in various facets of healthcare information technology – a one stop shop to meet, liaise with and explore opportunities with industry colleagues, partners, and collaborators from every corner of the industry. It’s where many in the industry attempt to put their best foot forward, and generate a critical mass of momentum to further sustain their journey on the road ahead. I am most looking forward to exploring opportunities to continue to innovate synergistically with groups and individuals who too have a burning desire to challenge the status quo and create solutions that will be transformational. There are many opportunities with technologies such as blockchain, capabilities such as machine learning, and in areas such as precision medicine, where we as an industry have so much progress to attain. HIMSS17 runs from Feb. 19-23, 2017 at the Orange County Convention Center. This article is part of our ongoing coverage of HIMSS17. Visit Destination HIMSS17 for previews, reporting live from the show floor and after the conference.